I remember when we were planning our wedding 3 years ago, we had to scout for good suppliers with our limited budget. Given such, we visited various wedding fairs to get good deals. If you're a bride-to-be, it would be great to see at least 1 wedding fair during your planning stage. In a wedding fair, all the different kinds of suppliers you need are gathered in one place. There are times when you have set your mind on a certain supplier but their schedule might not be available for your wedding (--good suppliers are fully booked waaayy in advance!). Visiting a wedding fair can open your mind to up-and-coming suppliers that can make your wedding dreams come true. 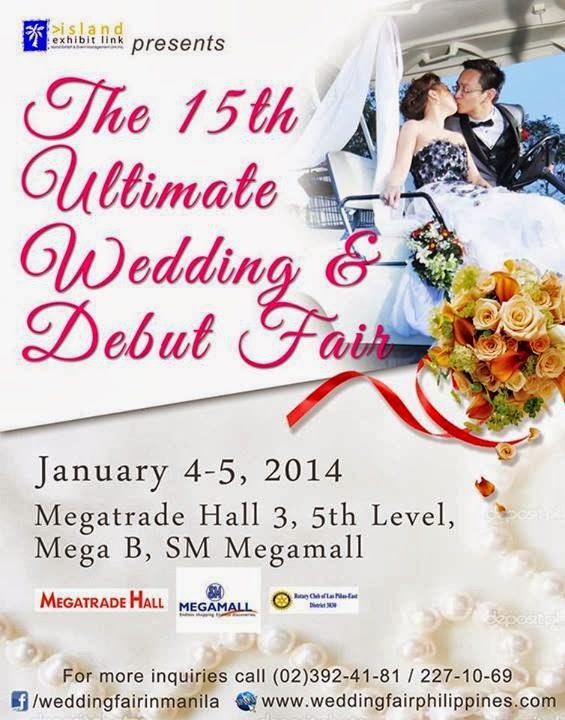 This January, greet the year with The 15th Ultimate Wedding & Debut Fair. This is definitely a must-go wedding event of the year as suppliers offer their best deals and discounts in one place with prices slashed to as much as 50% off! Good luck brides-to-be! See you at SM Megamall for this event this January 4-5, 2014.